After I wrecked the Turbosound in-ear stereo headphones, it was time to lookout for a new set of in-ear headphones for cycling and jogging. Eric Lin, who uses V-Moda earphones, gave me the tip to have a look at the AIAIAI-website based on some of his friends’ experiences. With a fair price-point of 55 euro’s (shipping excluded) I decided to give it a try and ordered a set of black AIAIAI Y-COM in-ear headphones. In this article I will share my thoughts and experiences so far. What’s in the “Box” ? 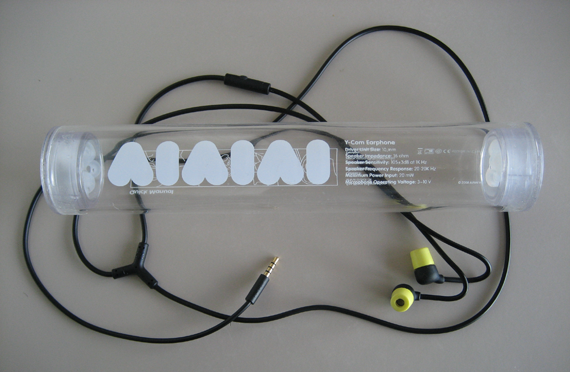 The AIAIAI Y-COM in-ear headphones are cleverly packed into a cylindrical hard-plastic package, as you can see in the overview picture above. In the top and bottom of the cylinder there are removable compartments, which contain additional five (!!!!) different sets of ear-plugs. When you open the website, you will notice that it’s flash-based and the graphics already target a specific user-group. One of the first characterizations of the AIAIAI-products is “cool” to wear and fashionable, which are reflected in some eye-catching details in the product design. 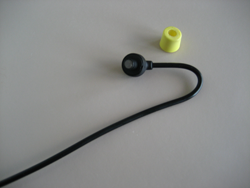 The first detail is the thickness of the cable, which is 2.5 mm in diameter. What I can’t see, but do hope for is is a wider diameter of the copper inner cable (compared to other headphones), resulting in a better audio performance and quality. The second detail is the sleek 3.5 mm, gold-plated plug. On the exterior of the black connection part between plug and cable is a nice AIAIAI logo, which emphasizes the level of detail in the product design. A third detail is the Y-part, which splits the cable to the left- and the right earphone. With a large L and R on this part the left- and the right earphone are clearly marked. 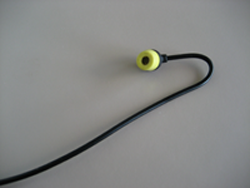 The “Y-splitter” is probably the product detail that resulted in the naming of the product (also remark the naming of the Swirl in-ear headphones [ref01]). The AIAIAI designer put a nice ON / OFF switch between the “Y-splitter” and the right ear-phone. This is very clever so I can pauze and play the music on my iPod Classic, without touching the device in the innerpocket of my jacket. This feature is also very helpfull on my road racing bike, when you don’t have the time to reach into the backpocket of the shirt. Furthermore it works when you have your gloves on. Finally all the AIAIAI headphones have a pre-bend cable at the last part of the cable just before the headphones. When you receive the headphones in the cylindrical case you might think the headphones are damaged, but the bend is made in there on purpose. Both on the hard plastic case, as well as in the user guide it is described to wear the cable of the headphones behind your ear, like the Shure in-ear headphones. The yellow foam earplugs reminded me (as a mechanical engineer) directly of the E-A-R Classic earplugs which you need to wear in noisy manufacturing environments. The idea is that you roll and squeeze the earplugs between your fingers and push the in your auditory channel. The foam expands and closes the auditory channel, resulting in a significant noise reduction. The same principle applies to the AIAIAI Y-COM in-ear headphones. I was very surprised with the level of noise reduction, while the headphones are extremely comfortable to wear, even under exercising conditions. Because the fit is simply great and pretty “deep” in your ear there are no problems if you are wearing a hat during jogging in the winter. One of the details that is very helpful under these winter circumstances is the on and off switch, which makes it easy to control you music player. It might be cool if you could also switch to the next- or previous song, but that might be a point of improvement in the next iteration of the product. Last but not least the sound quality of these headphones is remarkably good ! Okay, what you pay for is what you get, and some musicians or audio-lovers might question the sound quality of the AIAIAI Y-COM headphones. Of course there probably are technically superior in-ear headphones on the market (like the Shure E530 or the Ethymotic ER4 headphones), however the price point of these headphones is much higher. It doesn’t make these headphones very suitable for all day use, or during sports. I have put different styles of music on my iPod Classic: Rock, Trance, Pop and even Classical music. With all these styles the sound quality is high, which means a very clear sound output and low volumes as well as a good “color” of the music. What I perhaps miss is a small case to put away the AIAIAI Y-COM in-ear headphones, when not used. The hard plastic cylinder is way to large for that purpose. Luckily I do have a lot of compartments in my Crumpler Beancounter L messenger bag. Minor points of improvement, which even could improve the overall product- and user-experience is more controls on the on/off switch and the lack of a case to put away the headphones. Overall I think this pair of headphones provides a very good value for money, and you simply can’t go wrong with them. The additional sets of ear-plugs make the AIAIAI Y-COM in-ear headphones suitable for a wide audience. The price point is very interesting, and the product design is clever as well as fashionable. Also the customer service is great, and speedy. Therefore I could advise the AIAIAI Y-COM in-ear headphones to everyone, you can’t go wrong !! A great many thanks to Eric Lin, for providing me with this excellent tip !! Hey!, I found this information for you: "AIAIAI Y-COM in-ear headphones". Here is the website link: https://www.remo-knops.com/product-review/aiaiai-y-com-in-ear-headphones/. Thank you.